Prescription painkillers provide a great amount of relief from pain and are an essential part of cancer treatment. However, the opiate drugs prescribed to help manage pain in cancer patients are extremely potent and addicting, and may result in the development of an opioid addiction. Pain is one of the most common symptoms in cancer patients. 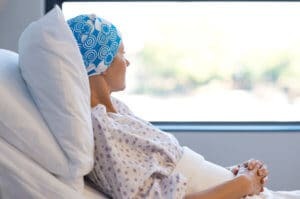 The pain patients experience can be caused by both the cancer itself and/or the treatments that they undergo in effort to eradicate the cancer. The type of pain a patient undergoes depends on a number of factors including: the type of cancer, how advanced the cancer is, where the cancer is located, and personal pain tolerance. Tumors can press on nerves, bones, and organs as they grow, causing debilitating aches and pains. Additionally, methods such as surgery, radiation, diagnostic procedures, and chemotherapy treatment can also all cause hampering pain. Younger patients are more likely to have cancer pain and pain flares than older patients, and patients with advanced cancer typically have more severe pain than others. Pain that is severe and/or continues after cancer treatment ends is called chronic pain; chronic pain is caused by nerve changes and can be present at all-times. Some patients may be disabled by their pain, unable to work or do everyday things on their own such as bathing, cooking, and eating. People might feel great emotional distress and grief due to these losses, which increases the chance of developing mental health disorders like depression and anxiety. Therefore, pain management is essential to improving and maintaining quality of life in patients. Opioids are highly addictive and powerful drugs; however, the risk for addiction amongst cancer patients that take pain medications as directed is low. Nevertheless, addiction can happen. Prescription opioids are typically safe when used as directed, but people who do not explicitly follow their doctor’s instructions or misuse their medication can become addicted. Most patients have no initial intention of abusing their prescription; addiction in cancer patients usually develops due to increased drug tolerance or fear of developing a drug tolerance. Over a period of time, a person routinely using an opioid prescription may start to feel as if the drug is no longer effectively managing pain as well as it once was in the beginning. This feeling is caused by an increased tolerance to the painkiller, which means that the substance has built up within the body and is no longer as potent. A tolerance can then cause a person to take larger doses than their recommended amount in order to achieve the pain-relieving effects they want. Increasing the medication dosage can then lead to a physical dependence, which is characterized by growing urges to continue using the drug – despite the negative consequences that may occur. Similarly, some patients become so scared of developing a tolerance to their medications and feeling pain from procedures, that they begin to take higher doses than prescribed to counteract this fear. This fear of tolerance then develops into an unhealthy cycle of abuse. Set a goal for pain management, and monitor the success of the treatment regimen. Track your pain on a 0 to 10 pain scale, and communicate the strength and prevalence of your pain to your doctor. Follow medication directions, and only take the drug as prescribed. Be aware of potential interactions your medication can cause when mixed with other drugs and/or alcohol. Never change the dosage or take a larger dose of medication without first consulting a doctor. Never share your own medication or use another person’s prescription. 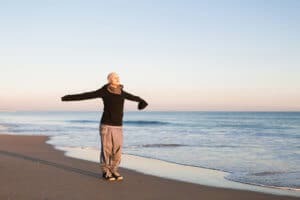 Additionally, there are other pain management techniques that do not include opioids that can be effective in treating pain in cancer patients. Therapeutic approaches such as acupuncture, massage, physical therapy, relaxation, meditation, and hypnosis have all proven to be useful in reducing pain and pain flares. There are also specialized treatments such as nerve blocks and other interventions that medical professionals can prescribe that are good pain management alternatives to opioids. If you are an individual that is recovering from cancer and struggling with an opioid addiction, know that you’re not alone and that there is help available. Addressing both cancer pain and substance abuse can be challenging, but has proven to be very successful when involving a multidisciplinary rehabilitation team. Methadone has also shown great results for simultaneously treating both opioid addiction and helping reduce pain in cancer patients. So don’t wait; contact a dedicated treatment specialist, and learn about your options today.